My name is Dee Short. I’m a writer, graphic designer, crafter and appreciator of all things creative. 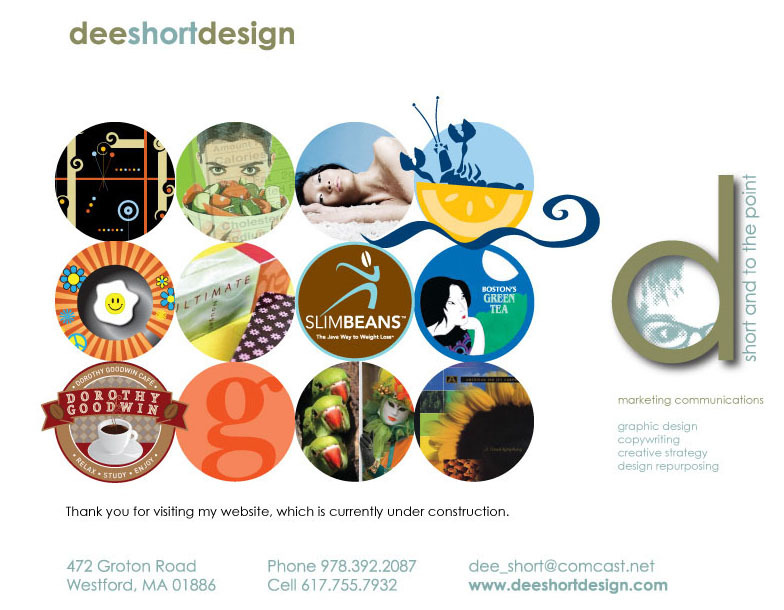 I have a marketing communication practice, Dee Short Design, and like to dabble in handmade greeting cards. I love, love, love paper. I’ve been struggling with designing a website, and it finally occurred to me that it’s probably a losing battle. I will never have the time to build a site that shows me or my work in an honest light. Or any light, for that matter. And if I do find that kind of time, it probably means I’m out of business. This landing page was created in 2009. What have I been doing for three years? Let me think. I’ve been feeling overwhelmed and taunted by the ‘elephant’ on my plate. Even one little bite at a time, it’s too big to digest. So many years, so many projects. And I don’t want a website that simply functions as an online portfolio. Borrrrring. Besides, design is subjective. If, by casual viewing, you don’t care for one (or more) of my designs, it does me a disservice. Every project is a collaboration, and when it’s complete, all that matters is a solid outcome and a satisfied client. Otherwise, I’m not in business. Which brings me to what else I’ve been doing: staying alive in this wretched economy. I’ve been watching the landscape shift and change. I’ve watched businesses merge or fall away; heard about the struggles of fellow designers. Some have thrown in the towel and are looking for other meaningful work, some are using food stamps(! ), some are close to retirement age, not sure if they should stick it out. Me? I’ve watched my income trending downward for the last three years, but I’m surviving. Adapt or die, so I adapt. Trim the fat, be more proactive with self-promotion and marketing. That’s why I’ve decided to create a limber blog, rather than labor on a lumbering website. This is a good fit for my constantly juggling attention span (or, to put a positive spin on it, my multitasking talents). It fits with my pinball machine neurons and synapses. It’s an indulgent place where I can dump my stuff. And you can get to know me, if you’d like. I enthusiastically welcome your comments with one caveat: please be polite and thoughtful. I encourage differing viewpoints, as long as they’re constructive.